I’ve got a quick post for you today about a breakfast that I’ve really been enjoying. 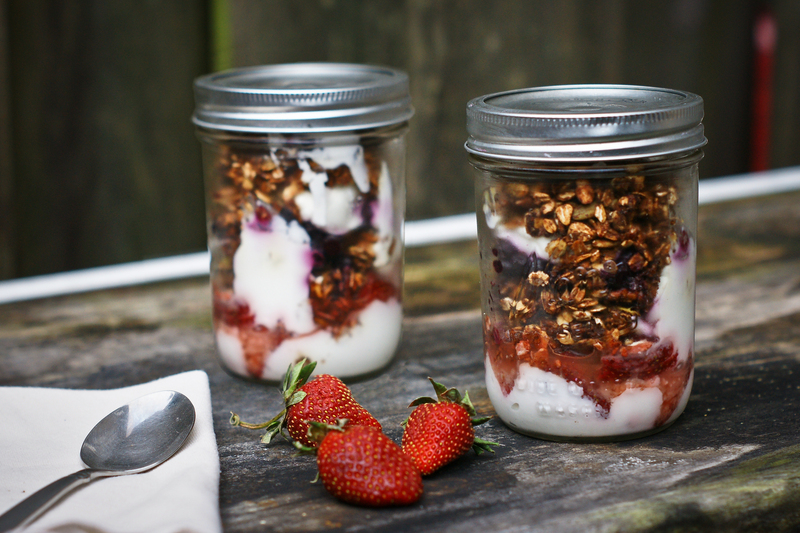 Granola, fruit, and yogurt parfaits assembled in a mason jar. I love the portability of it and they look pretty darn cute once assembled. It’s a great way to make you look forward to a healthy breakfast and honestly, these days (being enormously pregnant) it’s one of the only breakfasts that keeps me full for more than a minute. They are highly adaptable depending on what fruit you have on hand and what is in season and you can control the amount of sugar that you add to it. I just wrap my mason jar in a cloth napkin and put it in my lunch bag. When I get to work, it’s ready to eat! For this recipe, you’ll need 1 pint mason jars. Feel free to half the recipe if you want a smaller portion. I use whatever combination of nuts and seeds that I have on hand for the granola. You could also add 1 cup of dried fruit to the recipe if you would like, just add it 1/2 way through the cooking time. Makes about 4 parfaits. Preheat oven to 325 degrees. Thoroughly mix all ingredients in a large bowl. Spread granola evenly on a large, parchment lined sheet pan. Bake for 30-40 minutes, stirring every 15 minutes. Check after 30 minutes. If granola isn’t golden brown, stir again and allow to cook for 10 more minutes. Cool and store in an airtight container. Layer yogurt, honey, fruit, then granola in a mason jar. Repeat with one more layer. Tightly screw on the lid and store in the refrigerator. Can be assembled the night before. Thank you! I’ve been on maternity leave for…um…well…a year but am back in the saddle. More posts to come soon! this looks amazing, and I LOVE mason jars! Trying this out soon!!!! Thanks so much! Flax meal is just ground up flax seed. You can make your own by grinding flax seed up in a coffee grinder or you can buy it at Costco or most natural food stores. Thanks for clarifying this for me. Have a wonderful weekend. How much in advance can i make these?? They look so good!! You can make them the night before or a whole batch for the week–the granola just won’t be quite as crisp. Thanks!